With a sleek new look, Enlivened gets reinvented as a modern probiotic beverage for an Instagrammed world. Two decades ago, in Colorado for the Telluride Film Festival, Deana Dennard and Tom Boyd encountered the tiny but mighty probiotic kefir grains that would become their life’s work. In 2012, the couple opened The Kefiry. 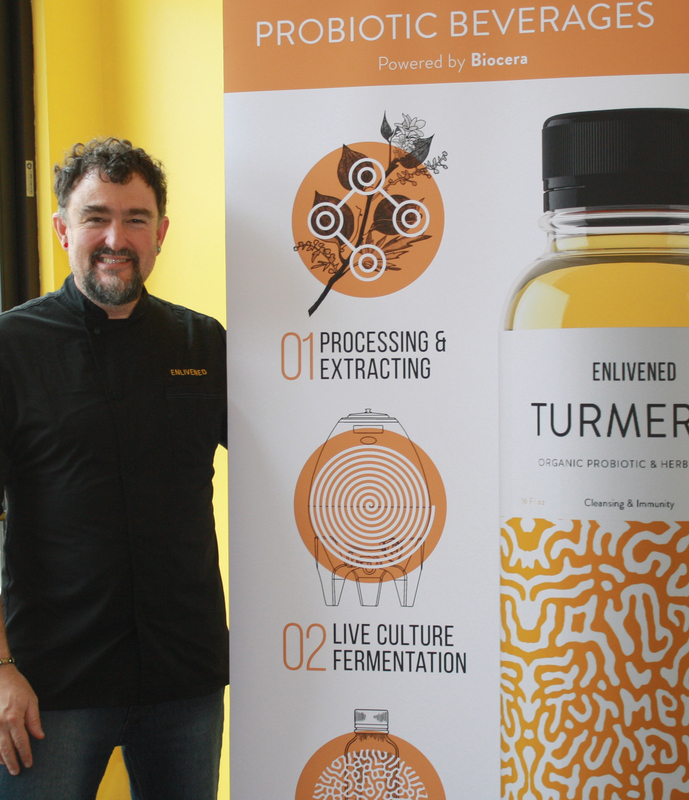 Tucked at the back of a strip mall on Gravenstein Highway in Sebastopol, the storefront and tasting room has become the flagship for Enlivened, their line of live culture fermented probiotic beverages in flavors like Tulsi Rose, Root Beer, Turmeric, Guayasa, and Lemon Ginger. The base of the naturally effervescent drink—which more closely resembles a subtle fruity sparkling water than a vinegary and tart kombucha—is an organic, nondairy kefir mother culture. The water kefir grains—along with herbs, spices, and sugar—are fermented in mineralized, alkaline water. The use of a very specific water isn’t a stretch for Boyd and Dennard. Before Enlivened, they owned a water company. A marketing attempt for that business led them down the probiotic path. To convey the taste benefits of their special water, they made up batches of kefir to give out. The response was eye-opening. An herbalist and ayurvedic practitioner, Dennard gave the kefir drink to her clients and the response was overwhelmingly positive. And so launched an eight-year journey to develop a dairy- and alcohol-free commercial formula. Found across the globe, kefir has added oomph to the human drinking diet for centuries. “The story of kefir is one of intrigue,” wrote Sandor Katz, a renowned fermentation guru, in Wild Fermentation. At The Kefiry, water kefir is for sharing. To that end, a small staff of “kefiristas” is trained to answer questions about the wee, gelatinous blobs living at the bottom of every glass and bottle in the tasting room. It’s hard not to be awed by the fact that each crystal contains as many microorganisms as there are people on earth—billions. In 2017, after six years of serving Enlivened out of the shop, at festivals, and in local independent grocers—tweaking the formula along the way—Boyd and Dennard decided to shed their mom-and-pop image and take a leap forward in business and marketing strategy. Boyd had always done the graphic design himself but the homespun aesthetic didn’t serve a desire to expand outside of the county. With the support of two angel investors—local entrepreneur Mark Swedlund and actor Stuart Townsend—they were able to enlist the services of a global marketing agency for a modern rebranding. Dennard makes all of the herb batches to be fermented with the kefir mothers. Unlike the many probiotic beverage companies that have become subsidiaries of multi-national corporations, the couple remain close to their product. “It’s about as close as you’ll get to a hand-crafted product made at home,” says Dennard. Yet, as the new branding makes clear, the couple are itching to expand beyond the boundaries of Sonoma County. They are set on getting Enlivened distributed throughout California by the end of 2018. And beverages are only the first piece of the puzzle, says Boyd. They’re working to find a co-packer for probiotic popsicles, which are already available in the shop; a powder-version is in the works. “What we’re about to do is going to shake things up for (the probiotic industry),” says Boyd with a gregarious smile. The Kefiry is located at 972 Gravenstein Hwy S. Suite 120, Sebastopol. Open Wednesday through Saturday, 11am to 5pm; 707.634.4906. 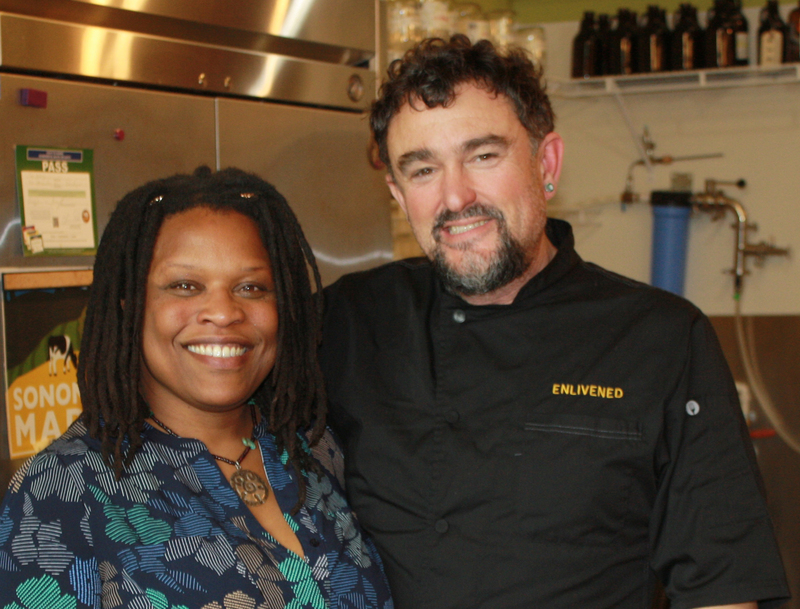 Find Enlivened in bottles at Oliver’s Market and other independent grocers. On tap at Handline, Healdsburg SHED, The Pharmacy, and Gypsy Cafe.